So today I took my daughter and her best friend to the Apple store at my local mall. They are running a free two day camp where the kids learn how to use IMovie or whatever it's called (I'm not very Apple-intelligent, except for my iphone). The parents, of course, have to stay in the store for the entire hour and a half (yes, we parents did wonder amonst ourselves if we could sneak away to the Starbucks - but alas, we knew that would not be very good parenting!). So I'm sitting here playing around on one of their laptops and trying to get some work done. I'm sitting on a rock hard stool in a pair of shorts. The stool edge is cutting into my legs and leaving that awful indentations, you know, like when you sit in wicker chairs, but without the crossweave. I'm wishing I had a bean bag chair right about NOW! Apple has done such an amazing job designing and decorating their store space (so much that a certain competitor, namely Microsoft, sort of made their stores look similar in my opinion). Well, that clean, simple, super bright store beckons me to come in for a visit everytime I pass by it. I hear the hum of excited techie nerds (and by nerd, I mean super cool smart people - we love nerds!). I see the cool graphics on the walls. And of course the incredible computers, iphones, ipads, etc. that Apple is so super famous for. So, why, dear Apple Gods, did you not think of placing bean bag chairs in your stores? It would be perfect, especially if you chose bean bags from Ahh! Products, since ours all have machine-washable covers, water-repellent, stain-resistant liners, and the best styles you can imagine. Bonus! Our all pass California Fire Code 117 too, so you can check that off your list! Yes, I do see the oversized black balls at the kids table, but for us adults, they don't cut it. They are too low, I feel like a giraffe trying to get a drink with my legs all splayed out! And I'm only 5 feet 2 inches tall! You should see my 6 foot 2 inch tall friend sitting on one of these ball seats - hilarious! Black balls aren't comfy either! I totally can see a space set aside with a low table, like the one they give the kids, with bean bags all around it. Also, they could have extra ones that don't necessarily have to be around the table, to use with a laptop on your lap - like I do at home. How many more laptops would Apple sell if they could show customers what it would feel like to use their awesome machines at home in such comfort! And hopefully those same customers would look up Ahhprods.com and get one of our bean bag chairs to recreate their total store experience. Well, except for the store staff roaming around (they would eat all your food anyway). And since we have so many styles to choose from, Apple could go total chic and clean and simple with a cream cotton one. 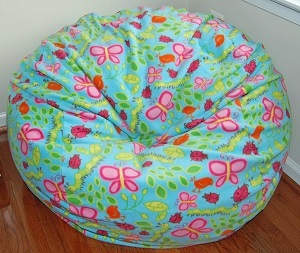 Or, better yet, go for our eco-friendly, organic bean bags because I know Apple fans are also Mother Earth fans! 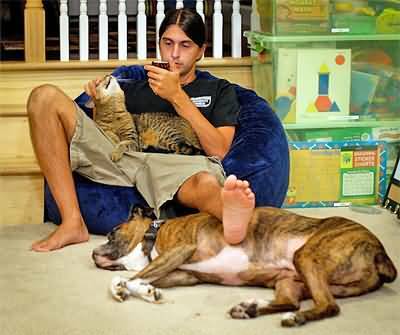 Checking your Iphone at the store can be as comfy as at home (minus the pets)! Hey, how about mix in some fun and interesting conversational pieces in with the solid colors? 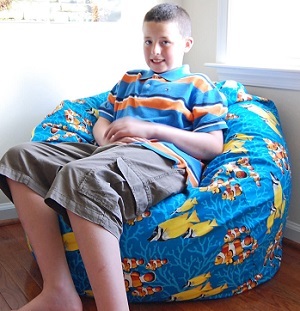 Or, take advantage of our custom ordering program, where you can send in your own cool Apple fabric and we will make the bean bag cover with that! We will supply all the rest (liners, filling, etc.). 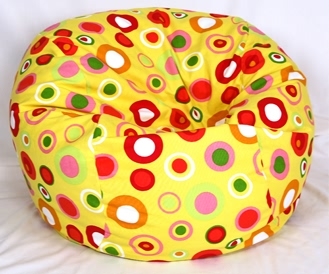 How awesome would customized Applicious bean bags look!? Add our professional embroidery and personalize each one with the Apple logo! Oh yeah! Hmmm...I think I might try to contact Apple and see if they would be interested in discussing my ideas! You are all welcome to request our products for your local store, too - maybe they will listen! What do you think? Would you sit in bean bags in the Apple store? What styles would you want to see there?